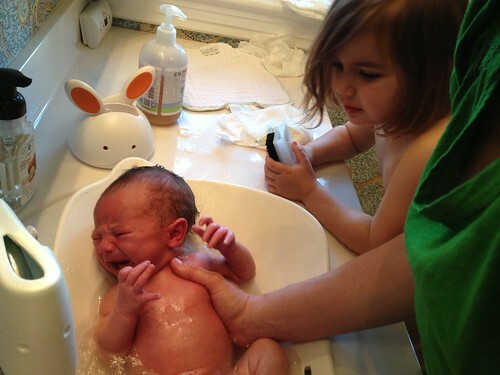 First Bath, a photo by carolinearmijo on Flickr. Yesterday we finally managed to give Ollie his first bath. I kept thinking that we would every day. Then the day would pass and I would realize that I hadn’t. Despite how things look in the picture, Oliver seemed to enjoy his bath. He even seemed somewhat relaxed while I washed his hair. Granted Lucy was eager to help scrub him down with this brush that was sent home from the hospital. After we finished his bath, Lucy commented that Ollie has a pig tail on the back of his head, just like Dad. I’m not sure about the Dad comment, but I didn’t go into full details about the difference between a pig tail and a rat tail. It is definitely the latter of the two. Maybe Lucy was referring to Henry’s most recent hair cut, which is not unlike Carol Brady’s mullet from the Seventies. Speaking of stars from the Seventies, Oliver had a feathery spiky hairdo after his shampoo. With his little pug nose, he looked a lot like Paul Williams. Maybe I sang the Rainbow Connection one too many times will he was in utero. Anyway I saved the little nails in an envelope. That sounds crazy, but they are SO TINY! I thought I would need evidence that he was this small one day. Granted I may need to tape them down to actually preserve them. Otherwise they may end up unnoticed along with someone’s thank you card.